At Norman Point the water was well up over the rock wall and even splashing over the stones at the top. The only birds were Silver Gulls which seem to be out in all weathers. This is a series of parking bays at the Point. The notice says that people should be aware that high tides and very wet weather can flood the area! 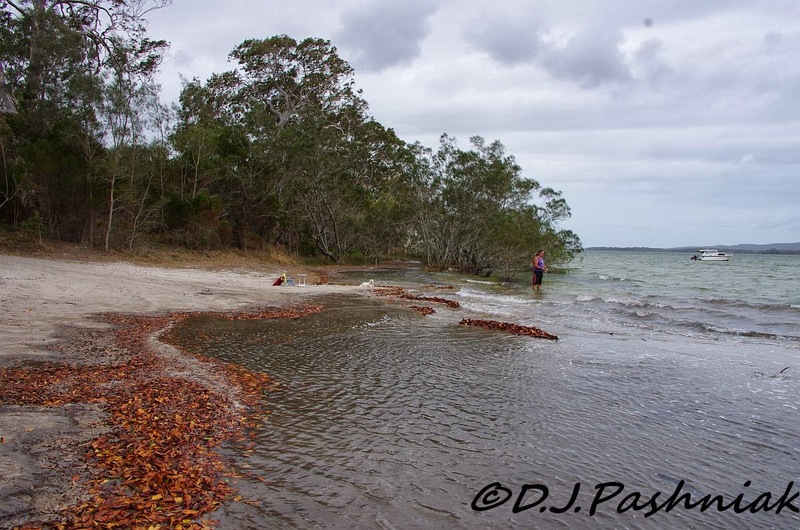 This photo is taken down at the Crab Creek end of the bay and is the easiest place to see just how high the king tide is for this year. 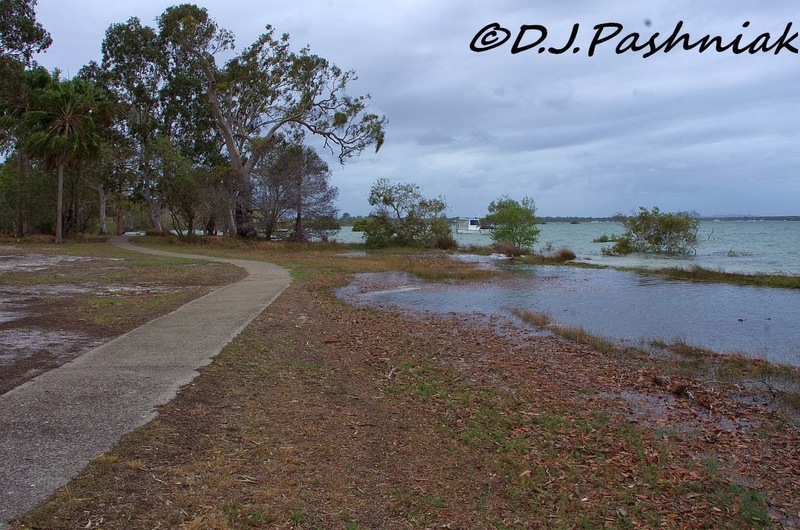 Back in 2009 on the king tide the water came up and over the concrete path. That is the only time I have seen it as high and this year was certainly nowhere near that record. 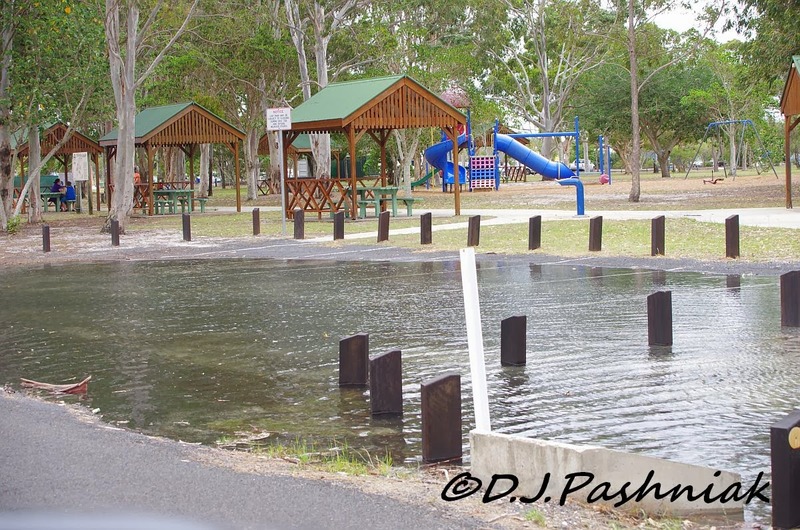 Down at the Mullens Creek Picnic area the water was into the parking area. Where the man is standing fishing with water up to his knees is where I usually park my car when I am going kayaking here. 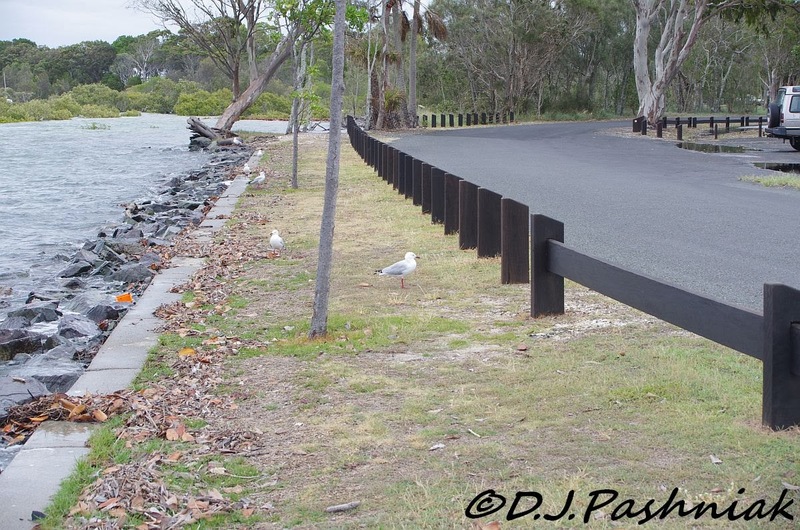 I am including photos of Terns which I saw on the previous day out at Inskip Point. I regularly see 6 different kinds of terns in this area and I photographed 4 of them that morning. 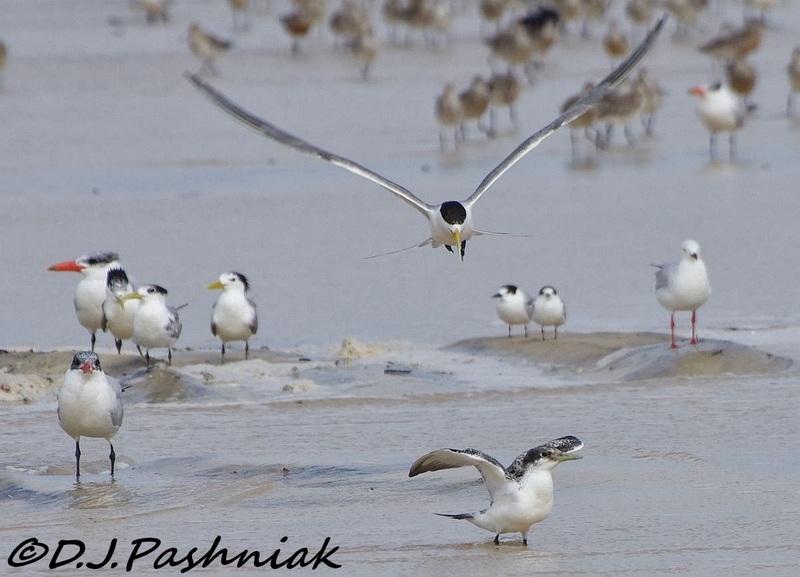 This photo shows the two largest terns seen around here - the very large Caspian Tern and the slightly smaller Crested Tern. The Caspian Tern has a large red/orange bill and the Crested Tern has a yellow bill. 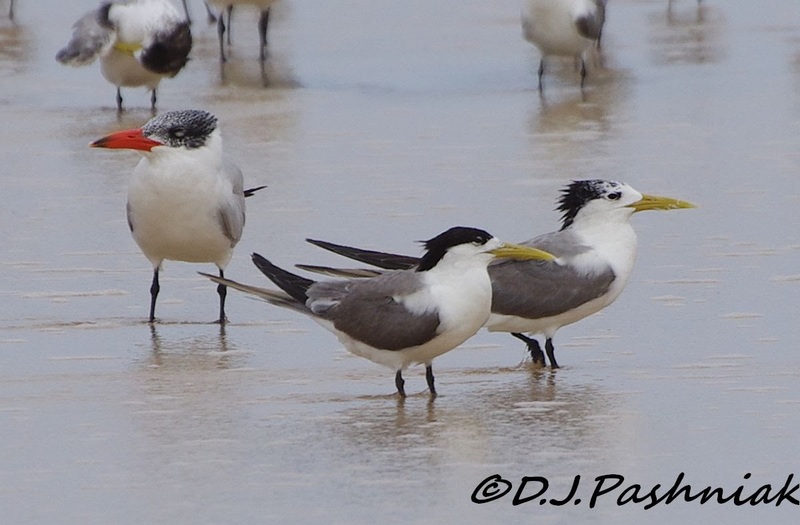 Both of these Terns stay in Australia all year although they move around during the breeding season. Crested Terns have recently been breeding. The bird on the left still has most of its breeding crest but the one of the right is beginning to get a slightly "scruffy" look! Terns always seem to me to have long wings and this Crested Tern coming in to land in front of me seems to have extra long ones. The bird in the front with its wings half spread is a juvenile Crested Tern born only a few months ago. 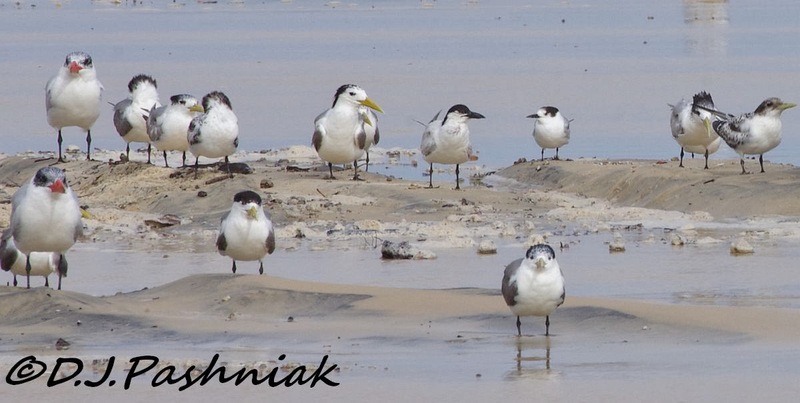 In this group of terns there are Caspian and Crested Terns and right in the middle a Common Tern and a Little Tern (both of these particular birds are migratory species although there is a Little Tern that stays in Australia all year). This photo shows the size difference between the Little Terns and a Crested Tern. Great series on the king tide. Thanks Neil, it looks interesting but definitely no good for kayaking, unfortunately! love the size comparison in the last shot. terns are such neat looking birds! Thanks for commenting Therese just wish I could get closer to the Little Terns for some really special photos but I find them the "skittiest" of all the terns! I relly appreciate seeing the size differences in those terns. All of them can occur here although Crested is extremely rare, Caspian less so, Little is declining and Common is common. What a fantastic day would be had here with those species all on the same bit of beach. Hi Phil, I didn't realize you saw the same Terns over your way as well. The Little Terns that breed and stay in Australia are also having a hard time - as are all birds that nest on the beaches also used by humans. The flocks of migratory terns are really great to see here in the summer. Thanks Carol - it's all such a contrast to the environment you show. Beautiful birds! :) Love them! Have a nice week! I am glad they warn people about this high tide. I have heard of it during previous years. The Terns are all wonderful.They are one of my favorite shorebirds. The juvie Crested Tern is cute. Wonderful post and photos! Have a happy week! Hi Eileen thanks for commenting. I have occasionally heard of people getting caught on the beach with the tide - but not recently - and it seems to me that it is because they haven't taken note of tide times. The sea is wonderful and exciting but not to be trifled with! Terrific captures and such a wonderful place, Mick!! I do love your bird shots!! Hope you have a great week!! Thanks for commenting Sylvia and glad you liked the photos of the Terns. What lovely bird shots! Hope the water doesn't rise any more! Looks like you need your kayak just to get to the car park! I'm sure that tide would not be fun in the 'yak. Great shots of your terns, Mick! The Caspian is quite common here and the Common is seen regularly. Our Least Tern is similar to the Little but the Crested does not occur here. Thanks for commenting Wally. It's interesting to hear which terns are seen over your way. Some of the terns are very wide-spread obviously - I think I need to do some reading about where they breed etc because I know where ours come from - but not the others. Never heard the term 'king tide' before, but I sure see what it means. My gosh. I've seen most of those kinds of terns but not altogether like that. The sign warning of possible flooding is kinda' funny under the circumstances. Thanks for commenting Sallie. I am always amused at the things our local government thinks are appropriate to put on signage - it certainly doesn't make sense to me! The terns are beautiful! We've had a lot of grey days too. Thanks for commenting Gunilla. Wouldn't it be great if the weather did what we would like it to do - always perfect! 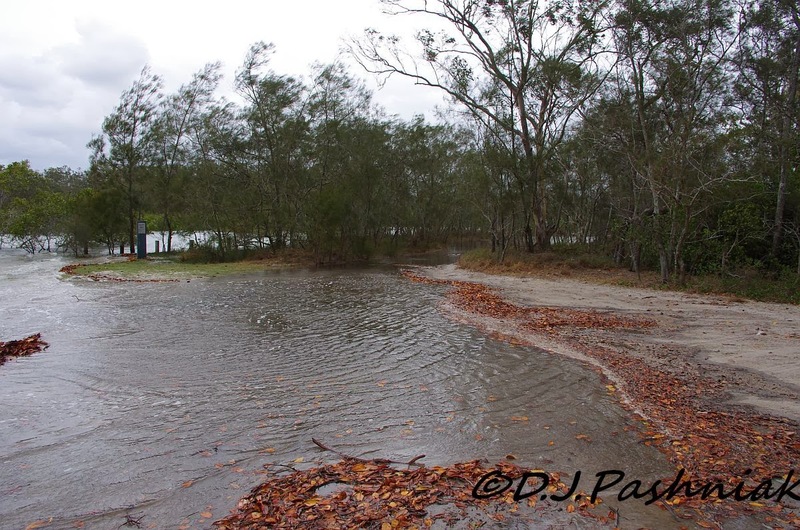 We have had lots of very high tides and storm surges over here as well, and so much rain. I could never ever get tired of watching terns. Thanks for commenting Findlay. We haven't had rain here - in fact we are in drought conditions despite the look of that sky. The ocean holds but great beauty and great danger and I, for one, give it a lot of respect! Love your photos, the terns are gorgeous! Hi Bettyl, I love the ocean in all its moods but my Dad taught me when I was very young to watch it carefully before I went into it. Thanks for commenting. I don't know if there are terns where you live - must be some kind of sea birds? I always enjoy weeing your shorebirds! Love the scruffies in #6! Thanks for commenting Karen - I think the scruffy ones look cute too! Thanks for commenting Carole and I agree with you about the comical look for the Crested Terns. I love the photos...the terns are wonderful. Hope the tide goes out also. Thanks so much for your comments on my blog. Thanks for commenting Nora. Glad you liked the Terns. The shore birds seem to be taking full advantage of the high tides, great shots. Thanks for commenting Gillian. The high tides definitely let you get closer to all the shorebirds.